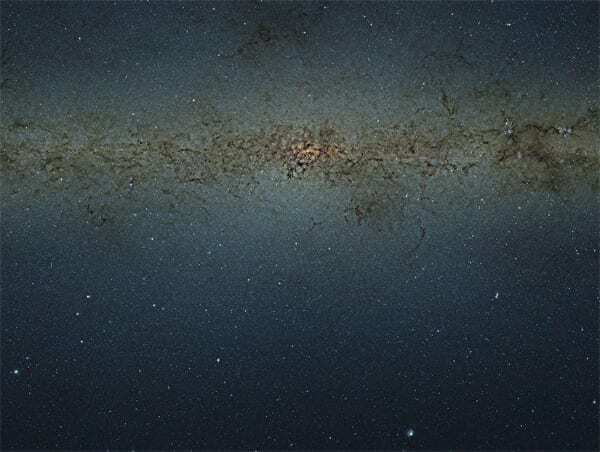 Taken by the Visible and Infrared Survey Telescope for Astronomy (VISTA) at the ESO’s Paranal Observatory in Chile, this 108,500×81,500-pixel image is an interesting case study for Olbers’ Paradox. Containing nearly 9 billion pixels — so large that if it were printed at the resolution of a standard book, it would measure 9×7 metres — it comprises thousands of stitched-together images taken using VISTA’s infrared camera at three different filter settings. The infrared camera cuts through things like dust fields, allowing the image to show stars that would be obscured in a normal spectrum view.